Equine Connection | Why Horses? Discover how to connect with your horses in an entirely remarkable way. Understand what they are clearly trying to communicate with you. Giving horses a chance to do their 'horse job' they do naturally. Love being with these breathtaking creatures? Love everything about them? What would it look like to you to be able to work with them to help people? How can a horse teach people without the facilitator truly understanding what the horse is saying? Whether you have had a passion with horses your whole life or have just started working with them, you will come away from this Certification with a new thought process on how your horse can 'speak'. You will have horse envy. The horse component is essential and a major part of this Certification. This will impact you and how you facilitate your programs. This will be the switch over from using your horses to working with your horses and will improve your relationships not only with your horses but all horses. They are the true teachers! They are the bread and butter of our business! Horses help people because they cannot judge nor can they lie. But why? This horse course is dedicated to the well-being of the horse and how they communicate with those who are coming to them for help. We allow our horses to be the teachers to the programs because they intuitively know the truths. Horses consistently react to the stimulus provided by participants. Some of the joys associated with working around horses are – they don’t judge, but they constantly assess. Their feedback is honest and instant. Learning to listen, to hear and to see what horses have to say is imperative to the success of your programs. We need to understand as we are changing people's lives and we must be an expert in understanding versus guessing. Our equine-assisted facilitators leave with knowledge of how the horse speaks so they can successfully run these objectively driven exercises with results to their communities. Horses can magnify an individual’s problem immediately and provide a skilled facilitator with an opportunity to identify an individual’s character and their communication style. Horses don’t overthink a participant’s motive but horses do challenge their behaviour and leadership. Why do we work with a prey animal VS a predator animal? Equine-Assisted Learning programs are a powerful journey of learning and understanding for those who participate. Horses in this program are effective teaching tools; immediately responding to what participants do, trained facilitators look for "teachable moments" that horses identify. Quite simply, the horse does the teaching; facilitators are there to offer explanation and provide guidance as they work through the solution. The single most asked question is, why do we work with horses? To understand how this process works we must first realize how horses learn and understand the laws of survival. In a horse’s world, the rules are clear, easy to understand and dealt with swiftly when challenged. Nature provides them with instincts and senses that are very astute. For their mere survival, a wild horse must be aware of their surroundings and quick to react. Horses are tough and steadfast dance partners; they don’t judge, but they don’t forget. They can read people hiding behind a facade and their feed back is honest. Dr Phil may have paraphrased "how’s that working for you" but horses have been asking since the beginning of time. The horse is known as "the teller of truth" who desires to "do the right thing". It is believed that a horse's spirit will lead individuals in the "right direction" and will assist them in understanding their place in the circle of life. If we, as facilitators, are willing to listen, they can assist us with guiding groups to becoming better individuals. 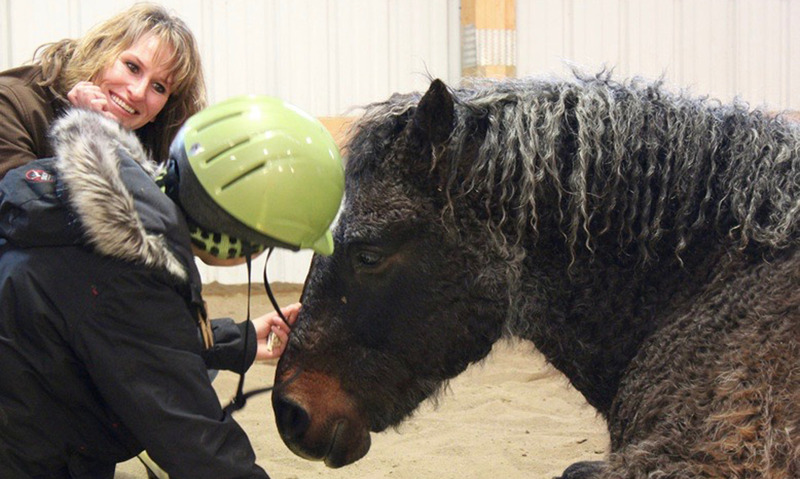 By including horses in specially designed educational experiences, equine-assisted specialists have significantly multiplied the participant’s rate of success to self-discovery. Through their intuitive nature and innate sensitivity, horses can provide facilitators with a window into the participant’s learning style. By understanding why and how horses are aware of our every movement – you will come to know how effective equine-assisted learning programs are to finding success. As a prey animal, they are sensitive to the stimulus of each participant. They react to the stimulus through body language and participants must adjust their feelings and behaviours to work successfully with the horses. As facilitators listen to a horse’s non-verbal communication, together, they have the ability to walk participants through to finding life-altering change. What can a horse teach you that a human can't? Horses consistently model assertiveness and teach us how. Horses can't lie or over think a participants motive. Horses have natural "herd behaviours" that require trust, respect and teamwork from all members of the team. Horses automatically respond to confusion and frustration as these feelings can put the herd at risk. They lead through assuredness - not brute force. Horses have distinct personalities and through this, they all have a different methods of teaching. Quite simply, equine-assisted learning, works. This horse business is all about working with our horses in understanding them and keeping not only them safe and happy, but our clients too.